In Django Unchained, Dr. King Schultz (Christoph Waltz) is a German dentist who has become a bounty hunter. 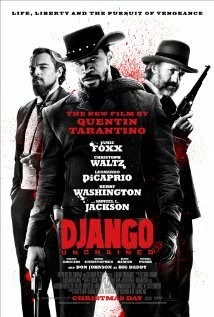 Bounty hunting Schultz explains to Django (Jamie Foxx), the slave he frees, is a little like slavery in that you pay money for flesh. The logic will recall the disquisition on the burger known as the Royale in Pulp Fiction. We right away know that we are in a parallel universe due to the absence of the usual parameters of good and evil that characterize the Western genre. This absence of the categorical imperative, of a Kantian moral imperative, is what many people find so disconcerting about Tarantino in general and this movie in particular. Spike Lee has refused to see it telling VibeTV that to do so would be “disrespectful to my ancestors." “American slavery was not a Sergio Leone spaghetti western,” Lee commented on Twitter. “It was a holocaust. My ancestors are slaves. Stolen from Africa. I will honor them." In Django, the camera lingers on blood shooting across sparkling cotton fields, on beer suds combed off of a mug, on the masks of a bunch of proto Klansmen (uproariously fighting over the eyeholes obscuring their vision). The desecrated antebellum houses are a mixture of Tara and Wes Anderson style magical realism. Spielberg’s Lincoln deals with a similar universe, but it’s light years away. Lincoln is about slavery and Django is about film. Schultz, who travels around the West and South, with a big tooth (which is actually a safe) hanging from the top of his wagon is really a stand in for Tarantino (who plays a cameo in the film). Though Schultz speaks English, he speaks in arch tones using words like “caterwauling” and “aficionado” which might as well be another language to the cowboys. Similarly, Tarantino is employing the language of post-modernism, forever estheticizing, in a guiltless and value free way, as he ventures into the hinterlands of cowboy and civil war mythology. One anomalie is the romance between Django and his wife, Broomhilde (Kerry Washington), a German speaking slave. It’s curiously believable and almost moving when Django dynamites Kevin Candle’s (Leonardo DiCaprio) plantation, Candyland, and rides off to freedom with the woman he loves.